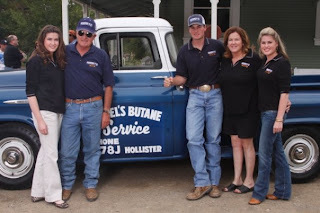 We had a major celebration for being in business since 1939! Holy mackerel - 70 years! Very proud of my family. Enjoy a few random pictures, mostly the eats! 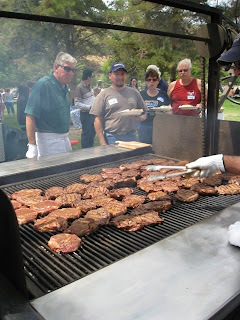 The event was catered by Kampf Fire Catering. 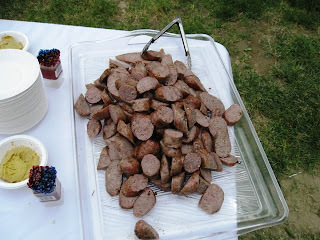 If you are interested in having them cater your event please shoot me a comment and I can get you the information. Sausages with mustard. Ultimate appetizer! Chips and salsa. My favorite. Oh and veggies, blah. 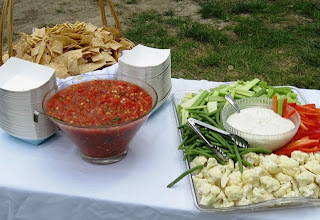 Notice, I was loading up on the salsa! 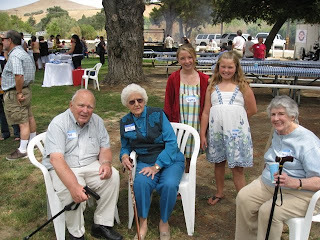 Long time friends - the Stewart's and my Grandma. 70 years - loud and proud! My plate. 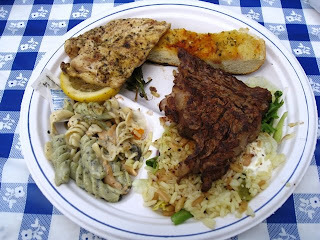 Steak, pasta salad, chicken, bread and salad with rice mixed in. 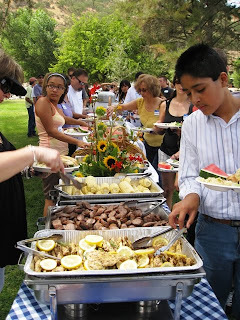 The food was great and everyone seemed to eat well. Wonderful day. 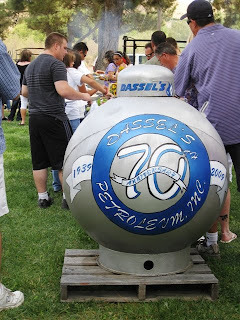 Congatulations to 70 years of business Dassel's Petroleum Inc.
Crater Lake is a caldera (crater cause by a volcanic eruption) lake located in the U.S. state of Oregon. 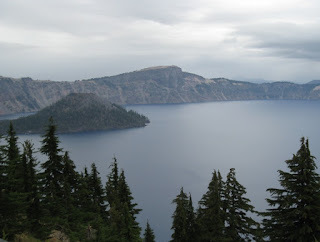 It is the main feature of Crater Lake National Park and famous for its deep blue color and water clarity. The lake partly fills a nearly 1,958 foot deep caldera that was formed around 7,700 BC by the collapse of the volcano Mount Mazama. Why am I letting you know this? Well, because I just learned those interesting facts while in Oregon at the Mebane Ranch Aged Event Cutting. My mom and I were having a lovely time hanging out at the cutting ALL day long but we needed to celebrate - I had just made the Finals in the Amateur Derby. Yay! 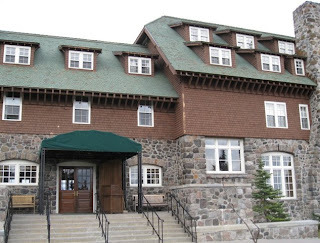 And, here we are at the Crater Lake Lodge - a monstrosity of a place. Rock and logs seem to decorate every inch of the Lodge. Very rustic and quite manly, I liked it. So that is a very burnt me posing in front of the Crater on the deck of the Lodge. We were waiting for our reservation so we killed some time with some cocktails and an appetizer. 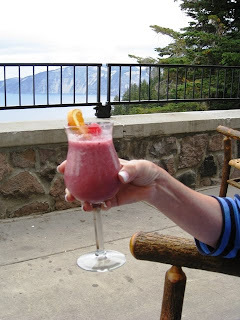 I had a pretty usual concoction of Absolute and Lemonade and my mom had a Mountain Colada - basically a Pina Colada with berries mixed in. We both found them to be quite refreshing. We were just starving so we had an appetizer delivered to us while we waited. 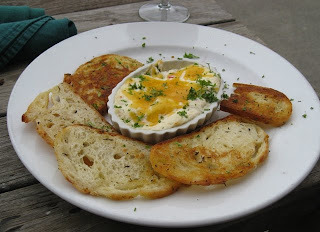 We decided on the Oregon Crab and Artichoke Melt with melted Tillamook cheddar, served with thyme infused crustinis. Not quite as much crab as I wished but, very good all the same. We browsed over the menu until we both said, "I just kind of want soup!" It had rained during the cutting that day so we both were seeking something comforting. 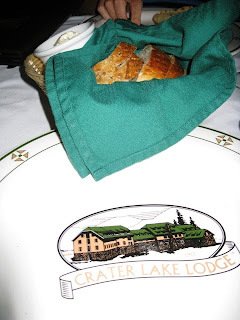 A bread basket full of rye bread and a hot bowl of clam chowder sounded perfect. 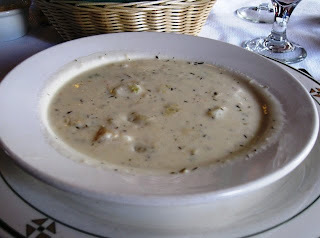 The chowder was ok. Not the best, too many large chunks of potatoes - cut those babies up please! I still ate until my bowl was clean though... couldn't have been that bad right? 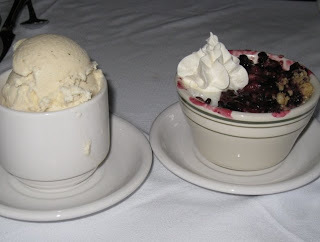 The dessert - Berry Cobbler with Vanilla Ice Cream on the side. Mehh... Not impressed. Just tasted like pie filling. Nothing else to say, isn't that awful that I have nothing nice to say about dessert?! 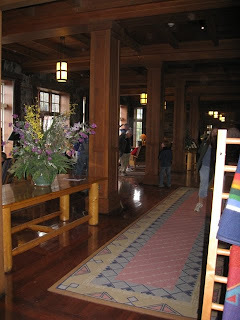 All in all the Lodge was a great place for us to visit during my week long stay at the cutting in Fort Klamath - which is 23 miles from the Crater. A $10 admission gets you into the park to sight see Oregon's only National Park, quite worth it. The food is ok, but it is sitting on the deck with a cocktail in hand is what was truly delightful. I will return during my next cutting adventures I am sure. 1.33 thumbs up. One is great, the other not so much. These are awesome! 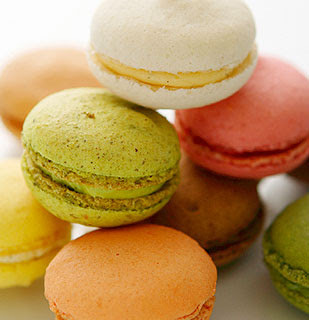 Macarons are sandwich-like pastries made with two thin cookies and a cream or ganache between the cookies. My favorite is Pistachio. Do not confuse them with Macaroons. Just ho-hum. 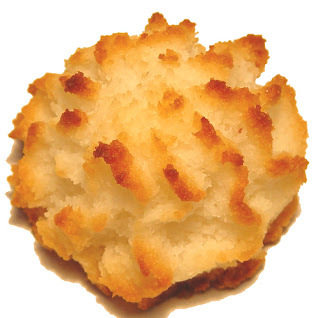 Macaroons are dense cookies made either with coconut or with a coarse almond paste. I just figured we needed to clear this up. 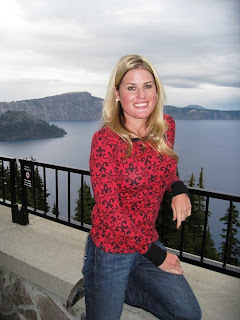 They are often confused and I needed to bring some clarity to the blog today. Thanks. 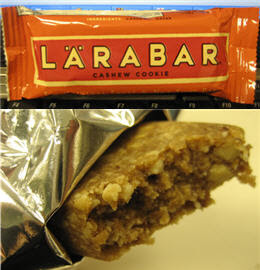 After scanning the shelves and seeing the words “Cashew” and “Cookie” I knew I’d found my perfect energy bar match. My mouth was not in love. First, this bar contains only dates and cashews. While I like those things and understand that they can be part of a delicious and healthy energy bar, on their own they do not equal a Cashew Cookie. In fact, they’re sort of like those no-bake cookies that you make once in awhile because you forget that they’re just not that great. I suppose that if the folks at Larabar added a dash of salt and a drop of vanilla to this snack then it would finally approach flavorful cookiedom. The long, true story of two American women, a couple of generations apart, who love French cooking and their husbands. 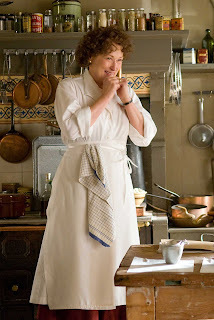 Meryl Streep’s Julia Child is enjoyably impish for awhile, tiresome after two hours. Amy Adams’ Julie Powell is a whiny blogger who adds nothing to movie. It’s all perfectly nice and of no dramatic interest whatsoever. Needless to say, I was disappointed. Don't go to the theater, and don't actually rent it. Wait until it comes out on TNT to watch it. In Child’s case, at least her success meant many Americans ate better and were inspired by her unpretentious enthusiasm. **SPOILER** The film’s best moment – and its only surprise – comes when we find out the elderly Child’s reaction to Julie’s project. As with everything else, it isn’t followed up. 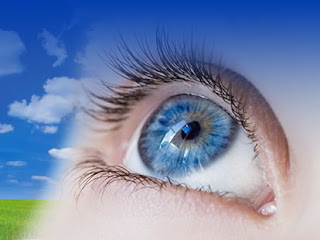 Don't think I forgot about you, I just had Lasik Eye Surgery. My left eye is pretty blood shot so dining out in public hasn't been on my mind lately! Other than the red eye, my vision is fine. Improving daily... Posts to follow! 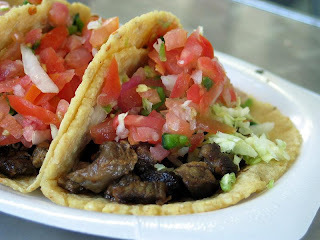 Carne Asada Tacos and Tamales - all homemade and totally delicious. I have been to this cutting before and had a breakfast burrito from these same people. Totally authentic. 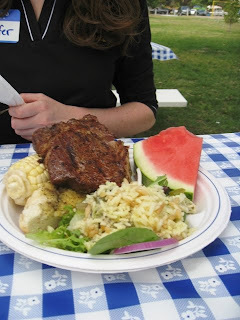 Life in the feedlot is not that painful when there is good eats like this! Yummo! Following another long day of cutting was a trip to Primarily Prime Rib - another fine dining establishment inside the South Coast Hotel and Casino. It is a pretty casual place but reservations are recommended, it can tend to fill up because it is a convenient place to grab a good meal in between gambling away your hard earned money. As you can see it is a pretty place to eat a wonderful meal. We sat right by the water feature - ha ha, all that atmosphere! 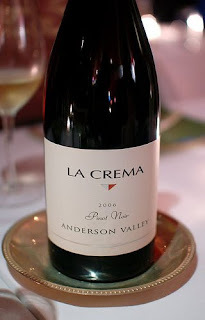 La Crema Pinot Noir made its way to our table and it was savored. Tasted great, it has always been consistently good. So I had my choice of soup - Pea or French Onion. 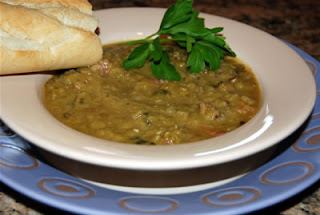 I went for the Pea Soup, it could be my years driving past Pea Soup Andersen's in Santa Nella. We would stop there as treat on the way home from horse shows, jackpots, you name it. Anyhow, it was very delicious, and I was satisfied. I did it again! I ordered fish. You are probably thinking, "She is at Primarily Prime Rib, why didn't she order the Prime Rib?!" Well, you see I was browsing the menu and saw this: Sauteed Sea Bass with a sesame seed crust on a bed of stir-fried vegetables with light teriyaki broth - doesn't that sound amazing?! I thought so! I went for it and was glad I did. 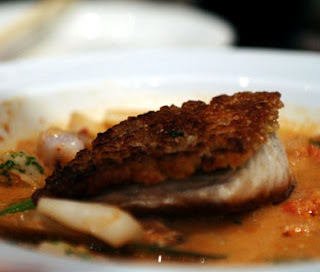 I want to say it was my favorite piece of fish of my entire Vegas trip, and I ate a lot of fish! I had a side of mashed potatoes that I never touched, I was just too full. Needless to say, no room for dessert. 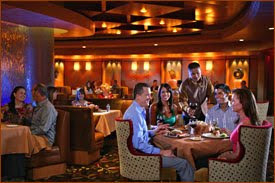 Away from the hustle and bustle of the casino on the mezzanine is South Point’s Primarily Prime Rib. Catering to hearty appetites, the menu features four flavorful prime rib cuts, dry aged to ensure tenderness, seasoned and slowly roasted. Other dishes aim to please all palates, including comfort foods like chicken and dumplings and sophisticated creations such as Maple Glazed Salmon. 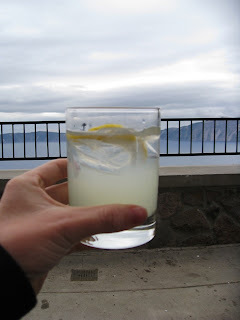 Sip on a signature cocktail or order a glass of wine, sit back and relax! I hope your experience will be as good as mine! Two thumbs up! 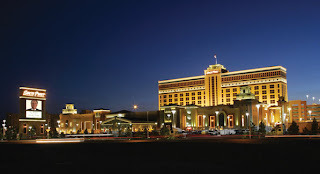 Famous New York chef Charlie Palmer brings his creations to Las Vegas. Aureole offers something a little different. 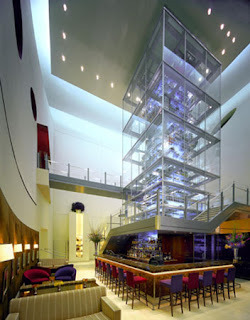 The first thing you will notice at Aureole is the three story wine tower. “Wine Angels” move through the tower on harnesses to retrieve your bottle of choice. The tower is made of glass so diners can watch the angels flying up and down the tower as they enjoy their meal. There is also a pond inside the restaurant that is home to its very own swans. 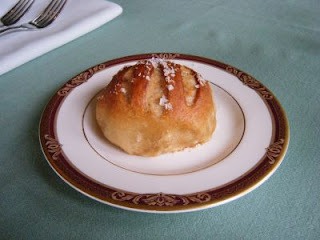 A pretzel roll started off the wonderful meal. There was bread service and this little delight was the star. Competing against it was a piece focaccia - it was also good but did not compare. I have one beef, why is the butter served ice cold? 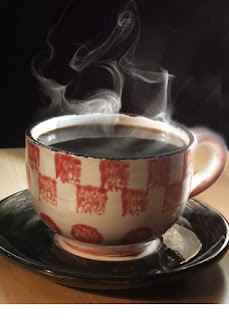 It needs to be served a smidge warmer please, makes spreading easier - thank you! 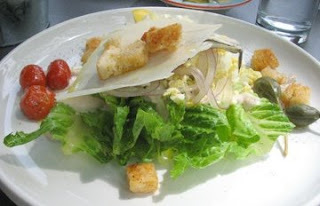 I had a small portion of the Caesar Salad wedge served, complete with anchovies served on the side! Fishy, salty and oh so delicious. 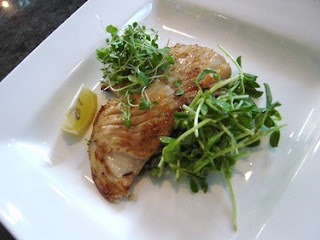 My entree was the Cod served along side pea shoots and sauteed summer squash peaking underneath. The fish was cooked perfectly! I was served a pretty hardy portion and made my way through it as the best I could. You eat a lot in Vegas! 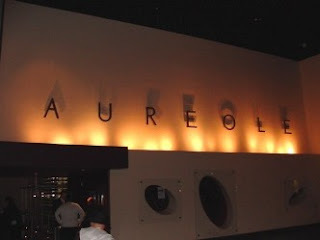 Aureole was an amazing place, sooo Vegas.... 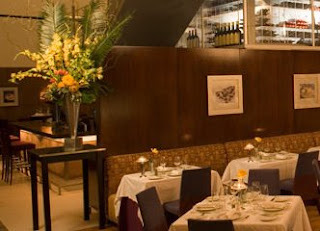 The restaurant is a complete dining experience that is like non-other on the Strip. Elegance, class, and cuisine that is considered “approachable French” will leave you with a dining experience that you will never forget. Would I return? Sure. Try something new on the menu? Of course. Maybe leave room some in my tummy to order dessert? YES! It was a tad pricey, but was very much worth it. Two thumbs up! Drinks and appetizers are what we had in mind. Nothing that was too heavy, or too potent. We made our way to Mix at The Hotel. 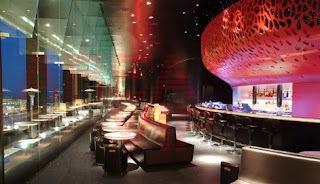 Go way, way up to the 64th Floor and there you will find not only a cool lounge, but a beautiful restaurant as well. Pretty futuristic setting right? It was hot out so they of course had the balcony closed but the view from the wavy bench seat was still pretty amazing. The strip at sunset is pretty darn cool. 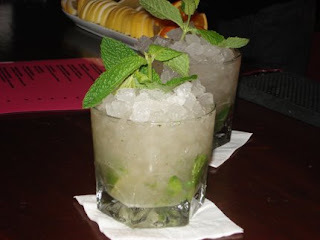 Mojitos for everyone! Or just for me... Anyhow, they were cool and refreshing. Just what the doctor ordered from a long day - dealing with horses and setting up camp. The right balance between tangy and sweet. An excellent Mojito. 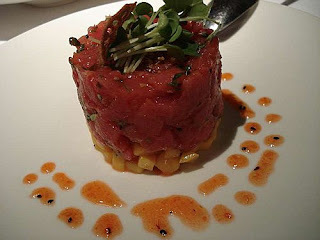 Not totally starved, we first ordered the Tuna Tartare. It came with a glass filled with won ton crisps that seemed to be a little fragile. Despite that, the actual tuna was to die for. Very fresh and just the perfect bites. Ok. So the Tuna was delicate and light but after drink number 2 we were starting to build up an appetite. We heard the waitress say... "cheese"... "pancetta"... - It was loud in there so we only heard parts of the description and so we say, "Ya-ok" over the beats of the music. 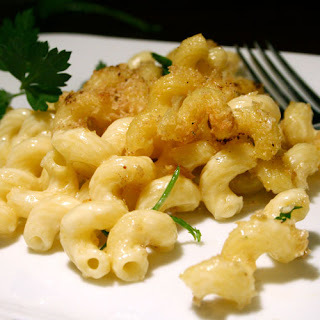 And out comes... Macaroni and Cheese. We laughed and ate it anyway. It was so Kraft style, but it didn't matter. 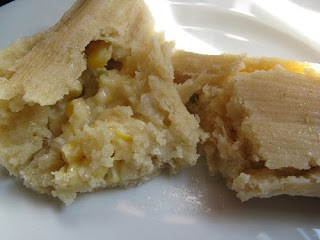 Still tasty and comforting. 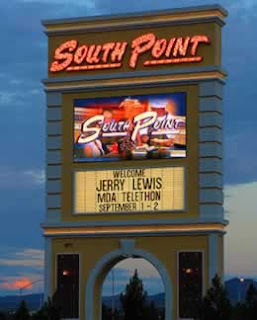 While in town for the NCHA Cutting I made my way through the lovely South Point Casino. If you have never been it is a wonderful facility. Full on Equestrian Center, with a wonderful set up - air conditioning to the extreme. The horses probably thought it was winter! Not bad for the middle of summer in Vegas! 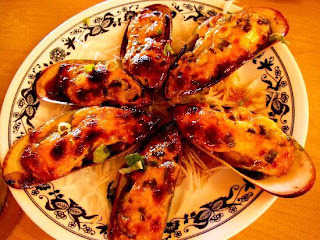 If your hungry and wandering around the casino, The Big Sur Oyster Bar is always a good place to grab a bite. In a hurry? You can almost always grab a seat at the bar and order your food right from the place mat. 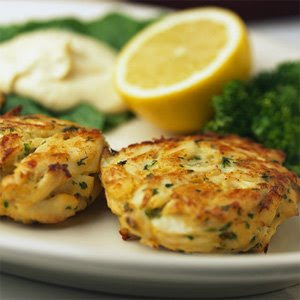 Crab Cake? Well, don't mind if I do. Super good. very impressed for quick, casino food. Very impressed. CATCH OF THE DAY! 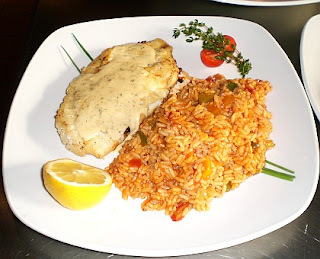 Orange Roughy that was yum, yum, yum. A very large portion and maybe too much rice. I ate what I could and left the rest. The cream sauce on the fish really sealed the deal. Stir it up with some rice, add a bite of fish and you have got Heaven on Earth. Was the Big Sur Oyster Bar the dining experience everyone dreams about? No probably not. Was it handy, quick and delicious? By gosh it was. Would I return? In a heart beat. Melissa Good Taste approves this message. 1.5 thumbs up for great taste and relative price.